This name derives from the Hebrew “Yirmeyâh / Yirmeyâhû”, meaning (the Lord loosens, God will uplift, Yah exalts). Jeremiah was one of the major prophets of the Hebrew Bible. 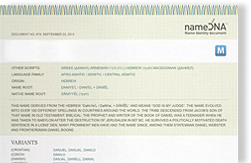 Judaism considers the Book of Jeremiah part of its canon, and regards Jeremiah as the second of the major prophets. Islam considers Jeremiah a prophet. Christianity also regards Jeremiah as a prophet and he is quoted in the New Testament.